Win up to 10,000 Times your Stake in Red Tiger Gaming's New Ninja Ways Slot. Experience the phenomenal skills and abilities of a true ninja in the latest slot release from Red Tiger Gaming, complete with free spins, mega symbols, and more. Make your way to traditional Japan to complete dangerous quests and you'll receive countless rewards for your efforts if you manage to survive. Fortunately, you will receive a ninja companion who will accompany you on your quests and unlock a wide variety of features thanks to his unbelievable skills and abilities which you will need along the way. The slot is called Ninja Ways and you'll be able to enjoy it on desktop, mobile, and tablet devices for added convenience. the new Ninja Ways slot from Red Tiger Gaming casino software comes equipped with 6 magnificent reels and 4 rows along with 4,096 Ways to Win. You will also be highly impressed with the plethora of bonus features embedded in the slot, including Ninja Spins, Ninja Wilds, Ninja Doors, and Ninja Ways along with a chance to win 10,000 times your total bet on each and every spin. The Ninja, portrayed with long blonde hair and a black mask, will represent the wild symbol on the 6x4 reel set, standing in for all regular symbols to form a winning combination. However, apart from playing the role of a traditional wild symbol, he also possesses a bunch of secret abilities to assist you during play. The Ninja also has the power to unlock every random feature infused into the base game. Once he makes an appearance on the reel set, you will be awarded one of three random features, including Ninja Ways, Ninja Doors, and Ninja Wilds. During Ninja Ways, the ninja will use his most powerful weapon to slash through each reel, leaving behind a trace of identical symbols to provide a huge win. During Ninja Doors, the Ninja will summon a mystery door that can reveal a 2x2, a 3x3, or even a 4x4 mega symbol. During Ninja Wilds, the Ninja will leap across the entire reel set and leave behind a trace of wild symbols and multipliers of up to 8 times. 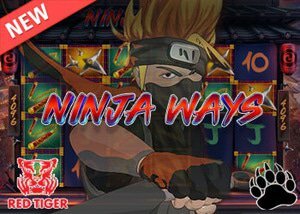 The new Ninja Ways slot from Red Tiger Gaming also boasts with a Ninja Free Spins feature which you can activate by landing at least 5 free spin symbols on adjacent reels which need to start on the leftmost reel. Each scatter will reveal a number and once each symbol number is summed up, the total will be your free spins amount. When a scatter lands during the free spin feature, you will also receive additional free spins. Furthermore, each free spin will offer at least one random feature to further increase your chances of winning big. The new Ninja Ways slot further impresses with a marvelous collection of slot symbols to complement the overall look and feel of the game. The yellow and black N is the highest paying symbol in the game, producing a staggering 8 times your total bet size when 6 are displayed across the reel set. You will also find three daggers, three ninja stars, and gold and red nunchakus. Apart from these high-paying symbols, you will also be treated to 5 lower-valued symbols, such as yellow Aces, deep-red Kings, dark-blue Queens, vibrant-green Jacks, and orange tens. The Ninja Ways slot also comes equipped with a wide variety of betting options even though it features 4,096 Ways to Win. You can choose from 10 different bet sizes that start from a mere $0.20 a spin up to a maximum of $10.00 a spin. This makes the new Ninja Ways slot ideal for beginners who enjoy low bets during their gaming sessions. The new Ninja Ways slot is considered a high variance game with a payout ratio of 96.03%. The slot is available at all Red Tiger Gaming casinos and you can play the new Ninja Ways slot at Videoslots Casino where you'll be greeted by a 100% welcome bonus up to a maximum of $200 along with 11 free spins on the immensely popular Rooks Revenge slot upon your arrival.